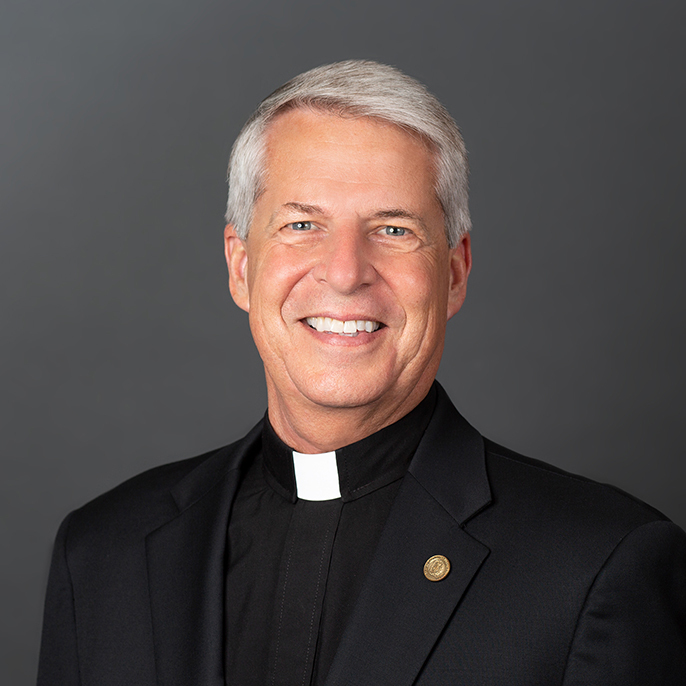 Father Mark L. Poorman, CSC serves as the 20th President of the University; he began his term on July 1, 2014. He has been at the University since 2011 serving as Executive Vice President and Professor of Theology. He is a native of Phoenix and graduated Phi Beta Kappa with a B.A. in English from the University of Illinois. He later received a Master of Divinity degree from the University of Notre Dame, professed final vows in the Congregation of Holy Cross in 1981, and was ordained a priest in 1982. He earned a PhD from the Graduate Theological Union in Berkeley, California, and then joined the faculty of theology at Notre Dame. Fr. Poorman's teaching and research concern moral theology and its pastoral implications. Among the topics on which he has written and lectured are health care ethics, character ethics, pastoral ministry, sexuality, student life in higher education, and Catholic higher education. From 1999-2010 he served as Notre Dame's Vice President for Student Affairs. Fr. Poorman is a member of the Board of Trustees of Stonehill College, the Board of Directors of King's College, and Board of Governors of the University of Notre Dame-Australia.